The first bubbling putrescence of a new reality has leached up from the foetid and fecund soil of my imagination. It began when I realised how strongly and continuously I was being drawn toward a seemingly mundane and telluric pencil work by the esteemed John Blanche. Irresistibly, I viewed it again and again. I sought out variant forms, almost as though habituated to its prospect as to an alchemical narcotic. Finally, I knew no other course which would alleviate my predilection. In the position of continuing to spool forth my beloved Morvalo-Anglian milieu, as well as maintaining a substantive efflusion of entries on this periodical record, I must throw aside all proper caution and begin the setting down of this terrible vision with which I had so lately been cursed. The basis of the entire setting is this one picture. It's an awesome John Blanche. Take it as a common and average vista in this world. I'll be calling this setting 'Grot.' It is quite grotty. A few things I know about it so far include the utter absence of halflings, hobbits, elves, and dwarves. Also, no orcs, not normal ones at least. Also, no humans. In fact, any player characters in the setting will have arrived there from somewhere else. This will put quite a damper on the usual 'stop by the merchant and stock up' sort of activity, but the main source of influx will be from a door within Castle Nicodemus. That is a gorgeous picture. It reminds me of twelfth and thirteenth century Chinese hanging scrolls by this one artist. Let me see if I can dig up his name for you. John Blanche does, indeed, have a singular and unique style. Unfortunately, it has become so closely associated with Warhammer, that I find it difficult to see anything but when I look at his work. 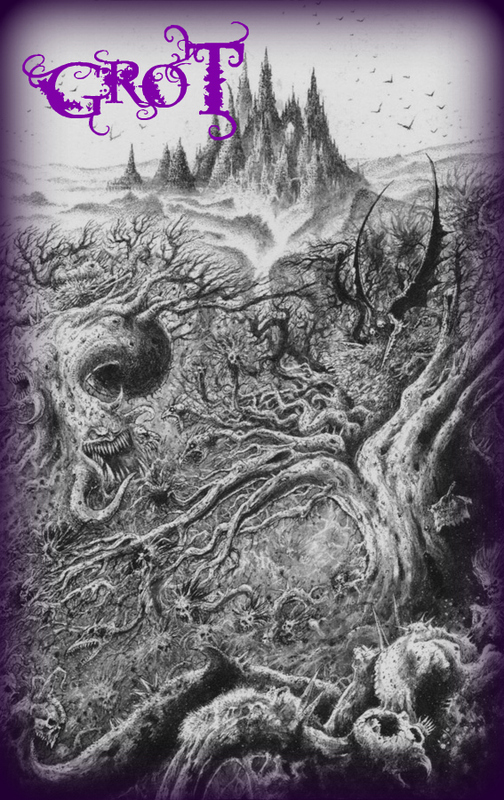 With respect to further inspiration for Grot, if you haven't already read it, I highly recommend The Throne of Bones, a collection of short stories by Brian McNaughton, through which his dark and horrific fantasy world gradually unfolds - a world that I could definitely see illustrated by Blanche. Thanks for those links Brendan, very awesome!